WebPagetest.org (WPT) is the site where you get answers to the ol' question: "Why do people say my oowsome site is slow? And what should I do about it?" Github is where you host code. These days we're so happy and spoiled with all these amazing tools around us. And yet, when you create a JSPerf test, you have to open all these browsers and run the test everywhere. Even IE. And, when on Mac, IE is usually not readily available. Plus it comes in a bunch versions - from almost-but-not-quite-forgotten IE6, all the way to IE10 The Greatest - and they have different, sometimes contradicting, performance characterics. It starts by inquiring about your WPT API key. I know, you have to get one. You can read the API docs on how to get one, but let me save you the trip: you just need to ask pmeenan@[the tool's domain].org for a key. Politely. Tell him I sent you. Promise not to abuse. The key is stored in your localStorage so you don't have to paste it all the time. Setting up the constant params of the API call. The variable param will be the location which will tell what browser to use. We also give the (undocumented) time a value of 60s, so that the test has time to run. We also want only one run and just the first run (no full cache run). 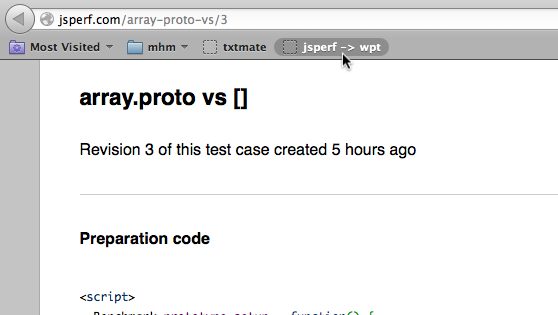 The URL to test will be the current page loaded in jsperf.com which is where you run the bookmarklet. And we'll append #run for autorun. Github has a "raw" version, e.g. this so we take this url, paste it in the bookmaker tool and we get a nice installable bookmarklet link. 3. Observe 5 new tabs with 5 IE versions running your test!